10. Refer to the exhibit. If the network administrator created a standard ACL that allows only devices that connect to the R2 G0/0 network access to the devices on the R1 G0/1 interface, how should the ACL be applied? Converting the wildcard mask 0.0.3.255 to binary and subtracting it from 255.255.255.255 yields a subnet mask of 255.255.252.0. Using the host parameter in a wildcard mask requires that all bits match the given address. 192.168.15.65 is the first valid host address in a subnetwork beginning with the subnetwork address 192.168.15.64. The subnet mask contains 4 host bits, yielding subnets with 16 addresses. 192.168.15.144 is a valid subnetwork address in a similar subnetwork. Change the wildcard mask 0.0.0.15 to binary and subtract it from 255.255.255.255, and the resulting subnet mask is 255.255.255.240. 192.168.3.64 is a subnetwork address in a subnet with 8 addresses. Convert 0.0.0.7 to binary and subtract it from 255.255.255.255, and the resulting subnet mask is 255.255.255.248. That mask contains 3 host bits, and yields 8 addresses. 2. What is a disadvantage of using dynamic routing protocols? 4. An OSPF enabled router is processing learned routes to select best paths to reach a destination network. What is the OSPF algorithm evaluating as the metric? 5. After a network topology change occurs, which distance vector routing protocol can send an update message directly to a single neighboring router without unnecessarily notifying other routers? 6. What is the purpose of the passive-interface command? 8. While configuring RIPv2 on an enterprise network, an engineer enters the command network 192.168.10.0 into router configuration mode. 9. Refer to the exhibit. A network administrator has issued the exhibited commands in an attempt to activate RIPng on interface gig0/0. What is causing the console message that is shown after RIP is enabled? Interface gig0/0 does not have a valid IPv6 address. IPv6 is not supported on this IOS. 10. Refer to the exhibit. OSPF is used in the network. Which path will be chosen by OSPF to send data packets from Net A to Net B? 13. When does a link-state router send LSPs to its neighbors? 14. Which routing protocol uses link-state information to build a map of the topology for computing the best path to each destination network? 15. A destination route in the routing table is indicated with a code D. Which kind of route entry is this? 16. Refer to the exhibit. Which interface will be the exit interface to forward a data packet with the destination IP address 172.16.0.66? 18. Which route is the best match for a packet entering a router with a destination address of 10.16.0.2? 19. Which type of route will require a router to perform a recursive lookup? 20. A router is configured to participate in multiple routing protocol: RIP, EIGRP, and OSPF. The router must send a packet to network 192.168.14.0. Which route will be used to forward the traffic? 21. Fill in the blank. Do not abbreviate. The routing table is created in the RAM of the router. The RIP process is stopped and all existing RIP configurations are erased. 26. Which dynamic routing protocol was developed as an exterior gateway protocol to interconnect different Internet providers? 27. In the context of routing protocols, what is a definition for time to convergence? 28. A destination route in the routing table is indicated witha code D. Which kind of route entry is this? 30. Which route is the best match for a packet entering a router with a destination address of 10.16.0.2? 31. 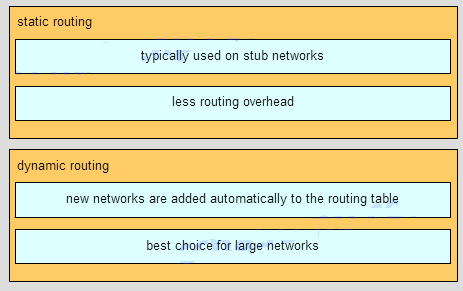 What is different between IPv6 routing table entries compared to IPv4 routing table entries? 32. Which route will a router use to forward an IPv4 packet after examining its routing table for the best match with the destination address?